1. 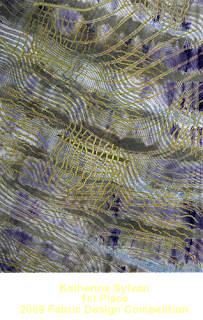 Couch down variegated fibers in swirling patterns to help bridge the painted colors. 2. Bead along the written words with a running stitch. The written letters may make it look like back stitch in this photo, but it's not. 3. Add clusters of beads to the background and sprinkle some beads around the flower centers. Make a travel art journal for when you want to jot or sketch ideas on the go. Vogue Knitting's new Stitchionary 5 - Lace knitting, is sublime, and you can win a copy of this luscious book! The first attempt was an absolute fiasco, but the second turned out a shade better for the peeling paint technique...check out this post to see, and the follow up to find how the piece has finished! Eileen has gathered advice on selling large lots of craft supplies. Is getting to be that time of year when people get out more whether it be day trips, camping trips, or gathering with friends and family and having picnics and barbecues! Find out how you can incorporate crafting into your camping and picnic fun. Aileen's excited to share her first how to video called Ribbon's & Lace. Take a quiet moment, grab a cuppa and stop by and see what its all about. Craftside's got a hot new Look. Learn, and Create video featuring Barbe Saint John showing us how to make a Steampunk hair pin, a free bow graphic download, how to add words to a journal page and a bow, and an inside peek into 1000 ideas from 100 Fashion Designers. Tammy is learning more every day when it comes to her Etsy shop, like the importance of tags and the number of items you should list, but it's definitely a work in progress. Read loads of great tips on Cross Stitch and then share your own - what tips and tricks have you learned that keep you out of tight spots? I am a sucker for sunflowers. 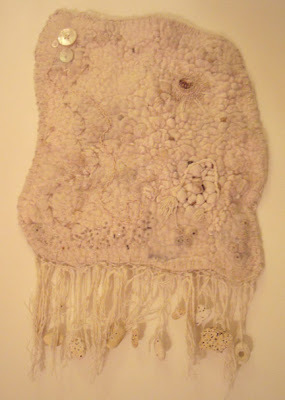 Last week I used a bead embroidered fiber piece to illustrate the need for plenty of material. Folks commented on it, so I thought it might be good to show you the very few in process shots that I have. This is how it started out: I used someone else's pattern to make the flowers, probably back in the early 90s. I'm ashamed to say that I've got no idea whose pattern they are, so if you know, please leave the info in the comments for me and I'll update this post. I originally appliqued them to a white men's style shirt which I wore over leggings. Ooo ick. Except that back then I actually looked pretty good in them! I'll take you through the rest of the steps next week! Sew your own wedding dress? Why not! Chloe shares some tips and tricks for creating a magical dress for your special day. How to weave a bias square on the potholder loom with Tarn- This is totally outside the box, and is also a great example of upcycling, recycling, re-purposing, reclaiming and re-using, as she uses Tarn (t shirt yarn) to weave the squares. Ideas for decorating canvas tote bags. And it's one, two, three strikes you're out... check out Linda's baseball quilt. Turn a vintage tie into a stylish tampon case with Madge in this week's Teen Craft project for ILoveToCreate! Enter to win a copy of Sweater Surgery! I know at this time of year many people are trying to think of ideas for graduation gifts, but how about making a special end-of-the-year gift for a special teacher? Aileen's offering some fabulous fractal freebie backgrounds for you to download and use! Seed packets are the inspiration for sprucing up your garden. Pop by Cathie's to see how. 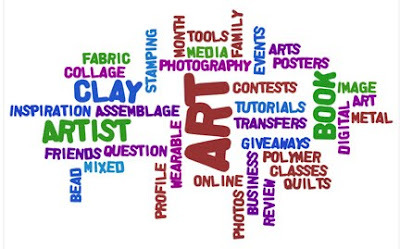 Craftside's got a chance to win a free copy of The Complete Photo Guide to Textile Art, and we are off to Maker Faire with our new roving reporter Stan. Stan is an Amineko (crocheted cat), see how to make his Steampunk business card holder made Sweater Surgery style, learn how to make a 4-ply braid, and to relax try this honey cucumber skin toner recipe. 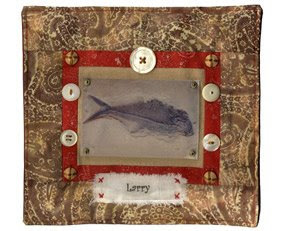 Tammy shares some crafted items she purchased during a recent trip to the Bahamas. Got a great source for free Cross Stitch patterns? 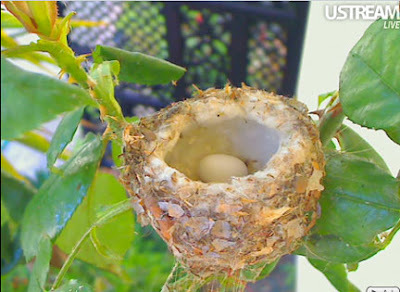 Check out Connie's list and then share your own. My friend Corinne Stubson, artist extraordinaire who has shared an artist profile with us here, has taken a video of the beginning work on a new journal she is making. 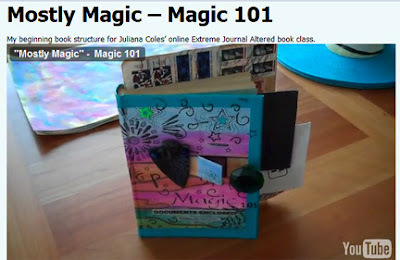 The video gives you a fascinating look into some of the variety of ways you can add tabs to an art journal or altered book. Starting with in-depth interviews and explorations of the work of five collage artists, this book brings you deep into their creative processes. 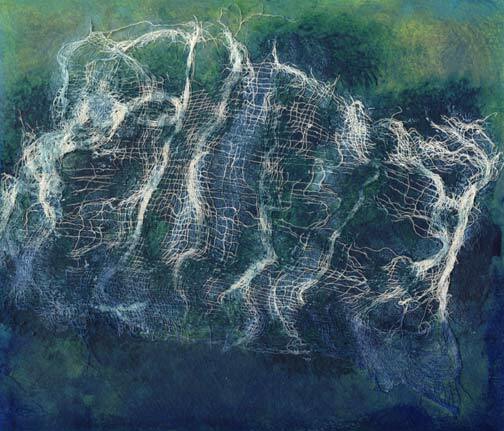 I found Laurinda Bedingfield’s work especially interesting, and immediately went to the internet to see if she has a website. Lucky us! Studio 61 is full of Laurinda’s artwork. Each profiled artist shares techniques as well, so this is not just a book for inspiration. 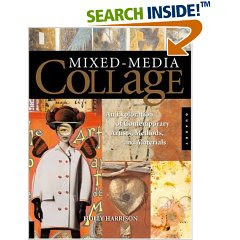 The steps that the artist goes through to create their signature work is quite abbreviated, though, so this is not the book for you if you’re really looking for a how-to book on collage techniques. 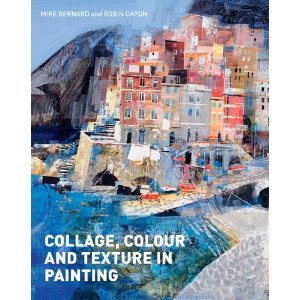 The second half of this book is a gallery, full of beautiful examples of the work on many well-known mixed media artists. Holly also managed to introduce me to some artists that I was not familiar with. I appreciated seeing more than the artists I already know and love. Just what you need, more fabric…right? Of course! Fabrics from all over the world! All the raw materials ~ cotton, silk, dyes, paints, marbling supplies, etc. 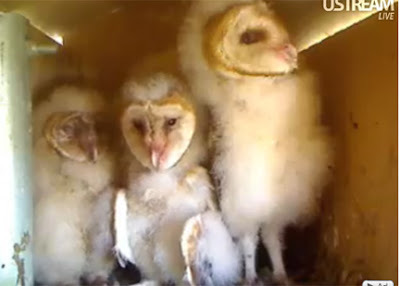 Once I started checking in with The Owl Box every once in awhile, it was only a matter of time before I started looking around for more cool bird cams. 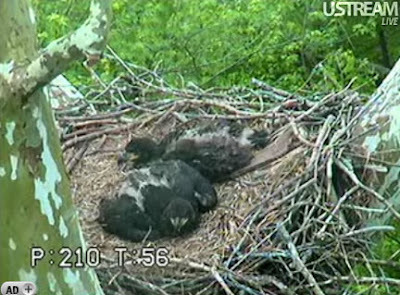 How about a Hummingbird Nest Cam and an Eagle Cam too? Just to be clear, I want you to know that I've not yet left any of those little messages that you see scrolling by! The linen is not ironed yet, obviously! I haven't quite decided how to finish it off. I experimented a bit more with embroidery after finishing my monochromatic postcard last month. The class with Sharon Boggon called Sumptuous Surfaces has drawn to a close, but I know I'll be incorporating a lot of what I learned into future projects. Using the same basic shape as a beginning, I added color to this one. It's really very similar to the first in many ways, but I did layer a few more stitches this time. If you'd like a list of the stitches used, that information is available in the series on the other postcard that is linked above. Take a look at parts one and two for a list of the flat stitches and the high relief stitches, respectively. This week I'm sharing a favorite recipe for a southern tradition...spoon bread! Chloe shares tips for creating your own wedding bouquet. Create something one of a kind and save money! For all the Guitar Hero and Rock Band video game fans out there. How to navigate the sea of digital file extensions. 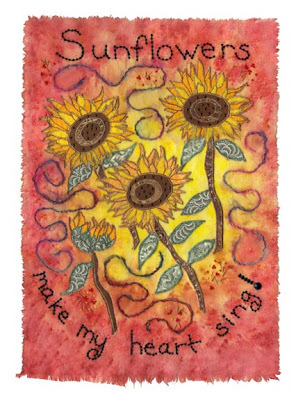 Create a stitching-themed sampler with a saying from Ellen Birdseye Wheaton. All back stitch and a single color of your choice. Challenging but quick stitch. Learn how you can make your own personalized garden stepping stones. Aileen's offering a Blog Giveaway! See what she's giving away and the many ways you can enter to win! 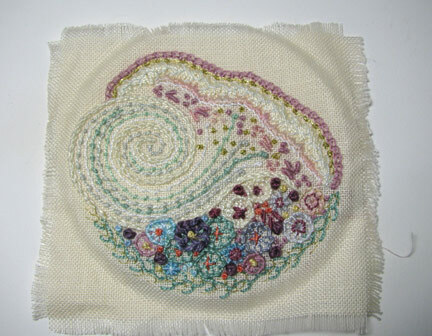 Cyndi has launched the first installment of her brand new e-book on bead embroidery...and it's free! Hurry over for your copy! 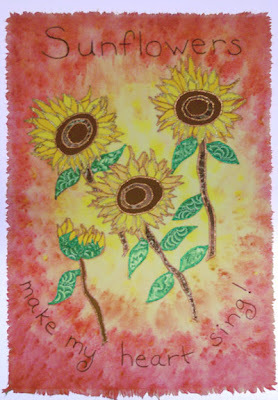 Cathie shows you how to print your own fabric with dishwaher gel and cookie cutters. At Craftside there is our author schedule for Maker Faire-booth #219!, Lab 47 from the wonderful book Collage Lab and the cake die cut design I did inspired by it, tips on how to get your dog to sit for a photo and info on the gallery opening A Consequential Tea in Brooklyn with Kristin Muller. Diane, how do you describe your work? 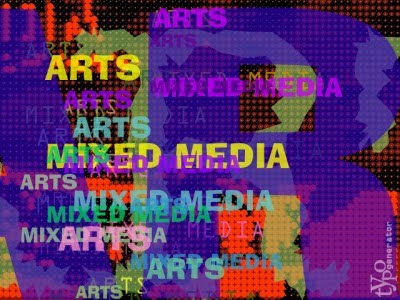 I'm a mixed media artist. I like a lot of color and texture. I'm always experimenting with different techniques and styles--right now I'm into whimsy. 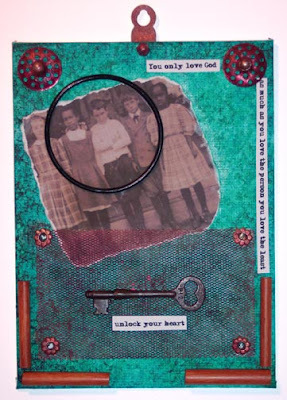 Last year it was more Victorian, so I'm always changing, which is why I love mixed media. I like the idea of my business name because that's how I want people to feel when they have my art--a keepsake--whatever the piece may be. I try to be intuitive about it, but I usually have an idea of what I want to do. As I get more into what I'm making is when it becomes more organic for me--I love this part. I'll work on a piece and then leave it for a few hours, and then come back with a fresh eye, and I'll find or see things that I never even thought of before--it's like the piece is taking over and telling me what to do. This doesn't happen all the time, but usually it does. I think that's my favorite part of making art. As far as the atmosphere in my art room while I'm there--sometimes I have music going or I'll put in a movie--or just silence--whatever strikes my fancy : ) Right now I'm enjoying the the music of the outdoors. Our Spring has finally arrived and I can open up the windows. 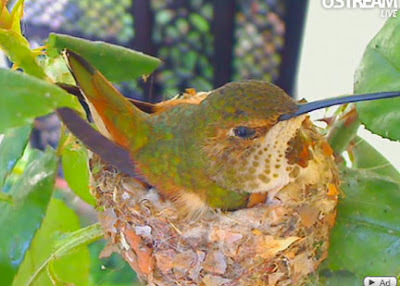 I can hear the birds, kids playing, and even the neighbors gossiping : ) I really do enjoy these sounds! Well as it happens, my last post is about how I had no formal training, which I'm actually glad about. 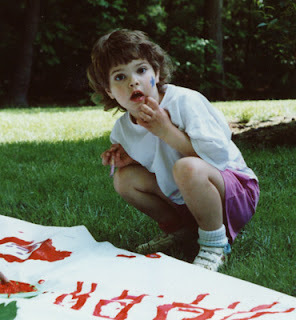 I don't want any rules when I make art---I want to be just like a child in art class--have fun. I've always been in some kind of craft all of my adult life, but it was about 5 years ago that I discovered mixed media. It was like a whole new world for me--so much to learn. I didn't even know what gel medium was! So where did I learn everything from?--mostly art books, and then in the last year, I' ve discovered online classes--I can't recommend these enough. If you find a class that interests you and sign up and remain dedicated to it, you WILL learn. Another new place that I credit my "education" to are blogs--what an amazing community of people who share their talents! Funny enough--probably gel medium--which I never even heard of 5 years ago--but of course there's my acrylics, paint brushes,etc.,etc., etc.! If you have the passion for it, then you'll keep going, no matter how fustrating it can get, if you're still learning. I know this is redundant, and everyone says this -- you just have to practice, practice, practice. And don't be so hard on yourself. I took a class with Mystele (Gut Art), and she always would tell us--it's the process, not the product. How will you learn if you don't try new stuff, and yes it will probably look awful to you, but don't stop, because you will learn--this is the learning process. I used to be like this--I still am, but I'm getting better. I would set myself up to fail before I even tried--what kind of attitude is that? Of course you'll fail if you think that--so I'm teaching myself NOT to think that way. Art---really--I have a problem--I'm addicted. I do however enjoy going to the movies once in a while. And on the weekends--garage sales and flea markets, but that's art related, because I'm looking for "art supplies" . I do love using pieces that have ayou history to them. I also enjoy the outdoors--I love being in the sun and taking walks. I would love to teach in a workshop, not online (that doesn't really appeal to me), but a real life workshop. 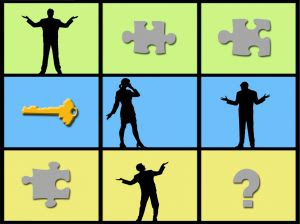 I love explaing the process, and I also love the excitement of people who want to learn. I sell my art at art shows, and I enjoy meeting and talking to people who are interested in my work and ask questions--this whole art experience is just fun!! My daughter recently introduced me to a new product called rubber glass. It's a silicone formula which dries completely clear and then can be fractured into fragments that look like glass or ice, depending upon how you break them up. They retain a soft edge, so there are no cuts to deal with! 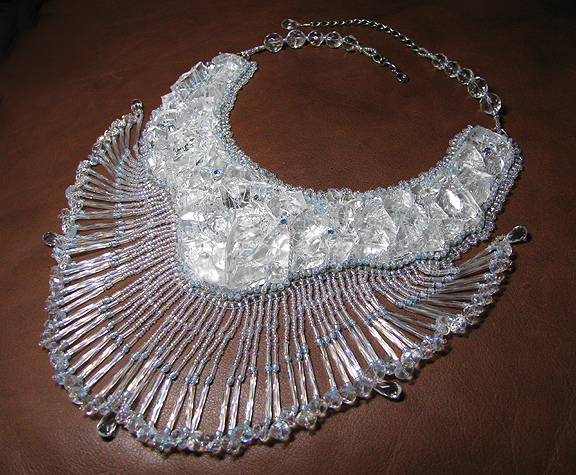 You can read more about it on Beading Arts. Ira Glass is has done a series on storytelling which surprisingly has everything to do with improving your artwork. Everyone needs to hear this, especially when they're in the beginning stage of developing their style and their work. I think maybe I'll start making a few more of these to have hanging around for when inspiration strikes. Honestly, I sometimes think that I like making the background papers and fabrics more than the finished pieces! 1. Gather up the acrylic paints that you want to use, a big piece of watercolor paper, sea sponges, paper towels, water, and a layer of cheese cloth. Take the time to spread the cheese cloth out and unwrinkle it. 2. Add a few layers of acrylics, sponging and scraping as you please. 3. Add the cheese cloth to a wet layer of paint, scrunching it as needed to fit the paper. Allow the paint to dry. Add more layers around the edges and randomly across the cloth to anchor it well to the paper. 4. Acrylic paint is adhesive, so this is probably going to be all the "glue" you need to use. However, if it doesn't stick well enough to suit you but you don't want to add more color, simple sponge on a layer of liquid acrylic medium, uncolored. That should do the trick! June is setting up a montly creativity prompt, and would LOVE having you play along...come see how it works and join in the fun! Have you seen the latest machine from Cricut? It's not for scrapbooking, it's for cake decorating! Katelyn talks about what goes into a digital collage. The DIY wedding series continues with tips and tricks for making your own wedding favors. Hmmm... the tooth fairy takes teeth and leaves money, so what does the Menopause fairy take and what does she leave behind? Well... hopefully a sense of humour and delight. Noreen has designed a fun homage to the Menopause Fairy, and has also uploaded a very neat new video tutorial on how to adapt a 4 peg spool knitter into a 5 peg spool knitter. So cool! Frugal ways to make a quick and easy bed quilt. Tammy is celebrating about her summer vacation, but at the same time, she's trying to focus on the long "to do" list! One of Connie's friends says the free When This You See pattern looks like a brain. Connie was inspired by the pocketbook plant. 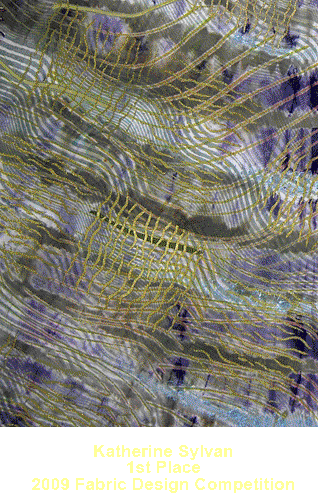 No matter what you see, the abstract design with traditional saying will be a fun stitch. Linda cut out the pieces for another of her Grandma Paper Doll quilts. Check out Violet's design. Madge reviews Jean Campbell's gorgeous new book Steampunk Style Jewelry. Drew has just released the names and addies of the Michaels test stores nationwide that will be carrying his new line of crochet tools and kits - starting THIS weekend! Let's celebrate Half-Way to Halloween! Some people may think that it is too early to think about Halloween, but actually, Halloween seems to top the of list of people's favorite crafting holidays. Alexa shows you how to make Fontalicious Wall Art that is bold, graphic, and fun! And definitely cheap and easy to do! Craftside's got a great tutorial on how to paint on fusible web, a photo of a beautiful Roman Stripe quilt from the book-The Quilt, fun photos from a bee field trip with author Kim Flottum and a "Mean Girl" Logo from the book Letterhead & Logo Design 10. I always wonder about what artists other folks find to be inspiring. Since I am primarily a mixed media jewelry artist, I am obviously inspired by the work of dozens of other jewelry artists. But I try not to copy their style. One of the best ways for me to avoid that is to fill my head with the beautiful and challenging works of art of people who work in different media! So I ask you: What designers or artists have had the most influence on you? You're welcome to point to any artists that you love, and please feel free to share with us about artists who don't work with the same materials that you do! You can leave your comment here, or email me at cyndi @ mazeltovjewelry.com (remove the spaces) if you'd like to share a piece of your work that is a good example of being inspired by another. Lynne Lewis, aka Liniecat at Large, likes to do a whole lot of things, and she does them all well! She writes about the ATCs shown above: "The ATCs are definitely more my normal sense of humour and the faces are from a pack of Danish cards I bought years ago whilst in Denmark. 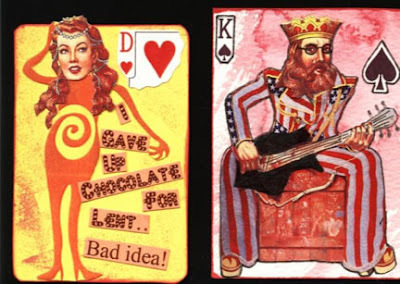 I don’t play cards but just loved the picture cards!!" 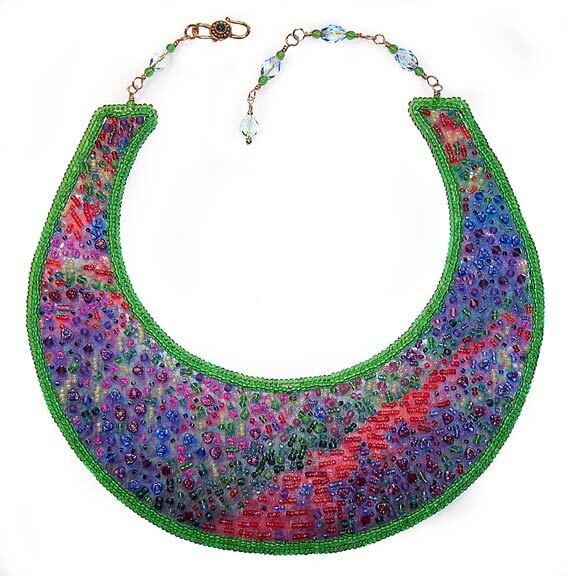 I really love all the different fibers and beads that Lyn has worked into the hanging shown above. About this felted piece, Lyn writes: "The beach felted hanging is my own, with small holey stones from an East Yorkshire beach, which I view as little portals into another world...silly, but they have to be more than just sea etched travellers...lol!" I love seeing the results of this contest each year...and this year is the sixth annual Toilet Paper Wedding Dress Contest! 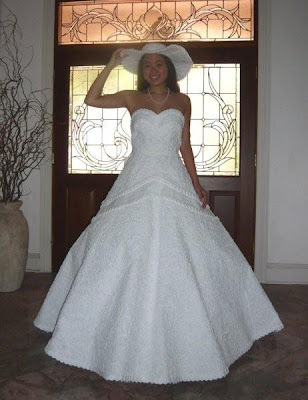 The deadline is May 15, 2010 to get your entry in ;-) I really love last year's winner, pictured above: Ann Kagawa Lee of Honolulu, Hawaii made this gorgeous Gone with the Wind inspired gown from nothing but toilet paper, tape, and glue. You only love God as much as you love the person that you love the least. I made this piece quite a few years ago, but recently I unearthed it from a pile that was waiting to be "written up". I believe that the photo was a class picture, and the little boy in the front row has his arms folded in disgust at being surrounded by giiiiirrrrls...yuck! 1. Sponge a small canvas board with the background colors that you want. I used dark, medium, and light turquoise shades of acrylic paints. 2. Scan and print out your focal image if you don't want to use the original. Spray it with some sealer or varnish to protect it. Print out any text you want to use, or hand write it. 3. From the hardware store, I used some assorted do-dads, a rubber gasket, and a piece of screen. From the junk pile, I plucked a rusted picture hanger. From an antique shop, I acquired a skeleton key, and in a craft store I found some decorative eyelets. 4. Arrange your trash and treasures, and decide how they will be layered. Use a Japanese screw punch if you have one to create holes where the screws, bolts, and eyelets will go. If you don't have a screw punch, you can create holes using nails, increasing the size with each puncture. 5. 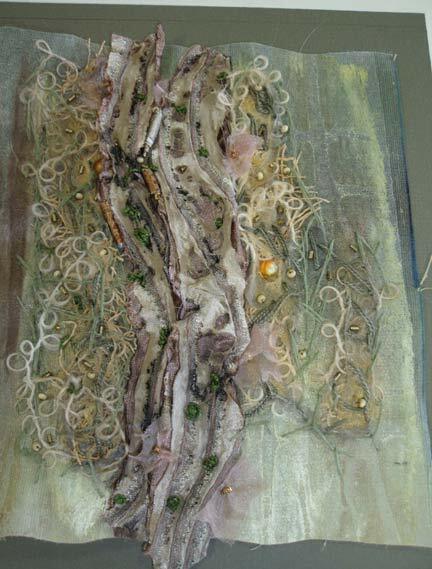 Attach pieces that need to be glued using acrylic medium or PVA glue. E6000 works well for heavier objects too. 60 Quick Knits is just wonderful, and, you can win a copy of it! Just leave a comment. Here's a quick little tutorial on how to create a barnacle texture with seed beads! Yummies...my version of strawberry tiramisu...come see! Step by step instructions and photos for making a cross cake for a First Communion, Easter, or Baptism. Love scrapbooking? Here are some homemade gift ideas to make using scrapbook supplies and techniques.